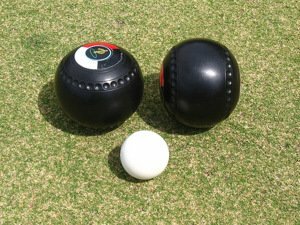 Bowls, also know as lawn bowls, is a game involving bowls – almost-spherical ball-like objects with flattened sides and a weight bias – and jacks (a smaller ball, this time spherical in shape), in which the former are rolled (bowled) towards the latter on the bowling green. It can be played indoors or outside on grass or artificial surfaces and on flat (flat-green bowls) or convex (crown-green bowls) pitches (greens). It has a long history that stretches back to at least the 13th century and possibly earlier, with the world’s oldest surviving bowling green – the Southampton Old Bowling Green – dating way back to 1299. It has had something of a coloured history too as it was seen by British monarchs such as Edward III, Richard II and Henry VIII banned the early versions of the game for fear that it would interfere with the archery practice of their troops. The first set of rules, the "Manual of Bowls Playing", was published in 1864 by a Glasgow cotton merchant named William Wallace Mitchell and formed the basis of the rules of the game as we know it today. Perhaps as a result of Mitchell’s rules, the home of the modern game is still in Scotland with the World Bowls Centre located in its capital Edinburgh. The object of the game is simple: to roll your bowls to as close a proximity to the jack as possible, and to ensure that one or more of your bowls are closer to the jack than any of those of your opponent. The equipment required to get started with bowls is relatively simple too, starting with the level (or convex for crown-green) playing surface, foot mats and the jack. Players would also generally require shoes with flat soles and a set of bowls. The bowls themselves come in a variety of sizes but are generally around 1.5kg in weight and possess a bias in weight so they roll in a curved path, the precise judgement of which is where much of the challenge of the game lies. The bowling green is usually split into individual “rinks” in which games are played as singles (one player against one other), pairs (two against two), triples or fours. The rinks are 4.3 to 5.8 metres wide and 31 to 40 metres long. There is a ditch at either end of the green which must be wide enough for bowls to be able to fall into it if they reach it. A point is awarded to the player or team whose bowl is closest to the jack at the end of a round (or “end”). If a player or team has more than one bowl closer to the jack than their opponents, they will score the corresponding number of points. The number of points required to win a game varies from competition to competition, but commonly the first player or team to reach 21 points or to have accumulated the greater number of points after 18 or 21 ends is declared the winner. Alternatively players could play “sets” whereby the first to score – for instance – seven points wins a set and the overall winner is the first to five sets (or an agreed number). Which player or team to bowl first is decided by the toss of a coin, after which the first bowler (the lead) places his/her mat and rolls the jack down the green. The jack must travel at least 23 metres to be “in play” and is moved to the centre of the rink once it comes to rest. The players then take turns to bowl, with points being scored by each bowl that is closer to the jack than the opponent’s closest bowl. Upon completion of an end play recommences in the opposite direction (i.e. from the end at which the jack previously rested). Bowls that fall into the ditch are disregarded, however close the jack may be to the ditch, unless they happen to touch the jack before going into the ditch. In that case they are still classified as in play. If the jack is knocked into the ditch though within the side boundaries of the rink it is still “alive” and in play. If it passes over the side boundary of the rink (whether in the ditch or not) a “ dead end” is declared and the end is replayed with no scores being counted. It is permissible – and often quite amusing! – to strike other players’ bowls with your own with the aim of gaining a strategic advantage.